Strongboy Props Hire. UK Delivery. From £6 Per Week. Making an opening in a load bearing wall can be a highly dangerous task with sometimes devastating results so opt for Strongboy hire and you can continue your job in complete safety and confidence. This handy attachment simply fits on to any Acrow Prop offering simplistic and robust security for any load bearing wall. And if you just need a Strongboy for a one-off task then Strongboy hire is an obvious, cost-effective solution. Strongboy hire is just a phone call away. Simply ring Lakeside-Hire and you can secure next-day delivery guaranteed. Experts at Lakeside-Hire can even give you handy tips and advice on how to make the most of your Strongboy and Acrow Props safely. 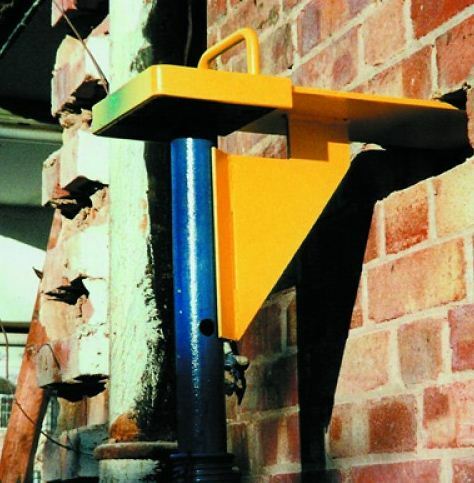 This super strong, efficient piece of equipment can be fitted between courses on a double skin brick cavity from either side of the wall and it can be used to adapt any adjustable steel prop. That means you can have total access to your work area and peace of mind knowing that the Strongboy will literally take the strain. When it comes to Strongboy hire from Lakeside-Hire, you know you will receive top-quality kit in tip top condition. All the Strongboys are strong, durable, meet nationally recommended safety guidelines and are vigorously tested to industry standards. The zinc-plated Strongboys can be used for any support structure or temporary beam adding a new dimension when it comes to extra security. Creating a new door or window can be a daunting and dangerous task so don’t take a risk and leave it to chance, make sure you opt for Strongboy hire so you can get on with the job with complete protection.